Promising young Reggae star, Spechinal has returned to the forefront with another track that’s sure to win the hearts of his growing female fan base. The emerging singjay has conjured up another hit with his latest track, Natural Girl; a single dedicated to women who don’t fake it to make it in life. This powerful song, produced by Shatta Don and Don Productions, shows Spechinal’s musical maturity while re-emphasizing his status as a legitimate threat within the local music industry. Paying homage to women who truly appreciate the blessings God gave them, Spechinal delivers lyrics representative of his love for natural women while inspiring girls who feel they have to alter their looks to earn special attention to deviate from having to do so. Spechinal’s words highlight the point that men should always look at the qualities that women possess inside before falling for an attractive outer presentation. Natural Girl truly hails as an inspiration that weaves, fake hair and makeup aren’t necessary tools to attract a man, as long as her heart and mind are in the right place and she’s not afraid to display her true self. 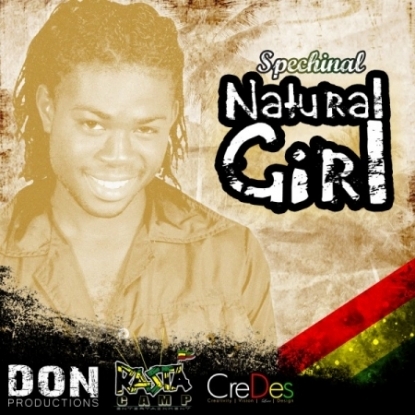 Natural Girl comes off the heels of successful tracks such as Cuss Me and True Love, which he released this past February, to rave reviews. Like those efforts, Spechinal aims to garner consistent rotation for Natural Girl as he seeks to stamp his authority within the Jamaican music scene this summer.